The VARTA pulse 6 is a 6.5kWh all-in-one lithium-ion AC battery that includes the battery, battery management system (BMS), inverter, controls, and monitoring all in one compact case. The VARTA pulse 6 is an easy to install, modular battery that is wired directly into the homes switchboard (230V). VARTA is the third largest selling home battery manufacturer in Europe today and growing. 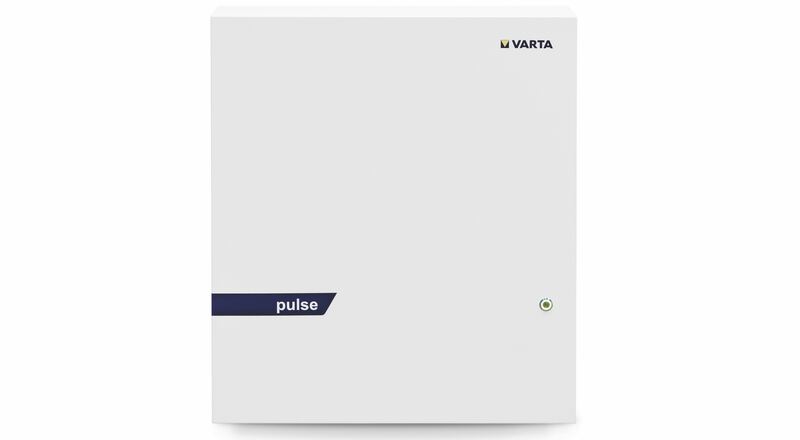 The VARTA pulse is a new compact version of the VARTA Element and was launched in Europe in May 2017. The VARTA pulse 6 has been designed to suit the Australian market with higher ambient temperature rating and compliance with CEC and distribution utility requirements. What we like about the VARTA pulse 6? It doesn’t matter what inverter is used on the solar system. The VARTA pulse 6 is simply wired into the switchboard and monitors energy that is exported to the grid. The VARTA pulse 6 automatically stores any excess solar energy for use at night. The VARTA pulse can be installed on any existing solar system without making any modifications to the solar system. This means there are no costs involved with modifying the existing solar system or changes that could negatively affect the original warranty. The VARTA pulse is simply installed on the wall and wired into the switchboard so it is very quick to install. This keeps costs down and ensures that every installation is high quality. We are very impressed with the high build quality and quality of the supporting documentation. VARTA’s pursuit of quality even goes beyond the product itself. Installers are required to undertake training and obtain certification from VARTA to install VARTA pulse systems. This ensures that the end customer receives a VARTA pulse 6 installed and commissioned as the manufacturer intended. Additional VARTA pulse batteries can be added in future to increase storage capacity. This functionality is currently available in Europe but not yet available in Australia. This will be available in the near future and can be added to any existing VARTA pulse batteries. Should there be a need to control loads an optional relay with 4 switches is available which can be used to control up to 4 loads (eg pool, hotwater system, pumps, etc) This functionality is currently available in Europe but not yet available in Australia. This will be available in the near future and can be added to any existing VARTA pulse batteries. The VARTA pulse has the ability to monitor the battery, energy consumption and also solar production. There is no need for any additional monitoring devices. For older solar systems with no remote monitoring this provides additional visibility of solar performance. The VARTA pulse even provides local weather conditions so you can see any coorelation solar production. Monitoring is available on any device connected to Internet. Laptop, tablet and smartphone and is FREE with each VARTA pulse. ✓Able to communicate with a variety of smart networking solutions. The VARTA pulse can be controlled by a variety of third-party applications for demand management and the provision of virtual power stations for electricity utilities.